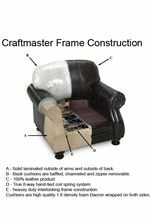 The 7185 Stationary Living Room Group by Craftmaster at Belfort Furniture in the Washington DC, Northern Virginia, Maryland and Fairfax VA area. Product availability may vary. Contact us for the most current availability on this product. 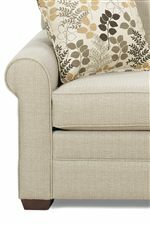 Fabric Options Custom order upholstery with hundreds of styles and over 1000 fabrics to choose from, allowing each customer to fulfill their decorating desires. Frame Construction 5/4 frame construction; rails are double doweled, glued and corner blocked for lasting stability. Padding & Ergonomics Heavily padded arms, 100% Dacron polyester fiber back cushion encased in sewn ticking with separate compartments. 2.0 density high resiliency foam core with secured Dacron wrapping; padded seat roll. 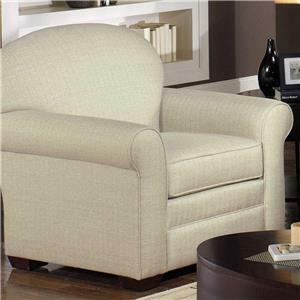 Gentle in comfort and design, the 718550 collection puts the mind and body at ease. Featuring a stationary sofa, chair, loveseat (not shown), ottoman (not shown), and sleeper, this group has everything you need to relax at all hours of the day and night. Marked by smooth sock arms, block wood feet, and arched seat backs, this casual, yet transitional collection creates a delicate and welcoming space for your family and friends. 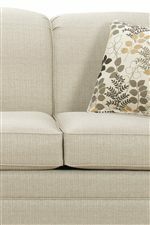 The 7185 collection is a great option if you are looking for Casual furniture in the Washington DC, Northern Virginia, Maryland and Fairfax VA area. 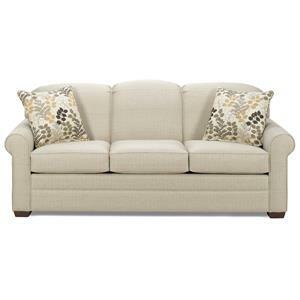 Browse other items in the 7185 collection from Belfort Furniture in the Washington DC, Northern Virginia, Maryland and Fairfax VA area.